Soft focus 35mm lenses are few and far between. 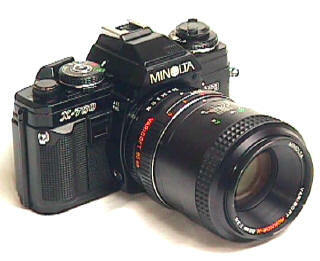 Minolta made this for their manual focus SLRs. Six elements in five groups, it has infinitely adjustable spherical aberration set on its 0 to 3 softness dial. 0 is sharp, 3 is maximum softness. The photog sees a definite visual change as softness dial is rotated. The effect, however, varies with the f/stop -- as in all soft focus lenses. The wider the f/stop, the more the effect. It will take some practice and experience to find the combination the photog likes best....and that could change with different films. True soft focus lenses like this one really do give noticeably better soft focus results than cheapie methods like Vaseline on a UV filter, gauze in front of the lens, the multitude of soft focus filters, or single element soft focus lenses. On top of that, different soft focus lenses give different effects. If you are serious about the best soft focus images, don't settle for less than a true soft focus lens. Warning: they are hard to find in 35mm. As 85's go, the Minolta Varisoft Rokkor X is a large lens, weighing just under a pound. Filter size is 55mm, close focus 2.6 feet meters. 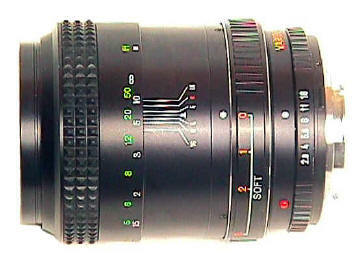 Lens diameter is 70mm. The filter ring to edge of camera mounting flange is 89mm at infinity and the 0 softness setting. At the 0 setting, the lens is very sharp, making it a soft or sharp focus lens. Length compresses to 82mm as softness is increased to the 3 setting. The front optic is deeply recessed, pretty much negating the need for a lens shade except for the very cautious. The lens will work on any of Minolta's manual focus SLRs. While the XD-11 and XE-7 are probably better built with metal top plates, I prefer the X-700 and X-570 with their TTL flash, motor drive, and excellent multi function data back -- features the XD-11 and XE-7 don't share. The X-700 and X-570 also share the same TTL flash units, off camera flash cord, and remote electronic cable that the Minolta CLE rangefinder uses. In mechanical SLRs, the various SRT-101 family members are great choices. 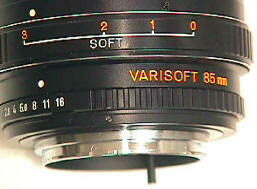 The Varisoft is capable of beautiful romantic effects: ideal for landscapes, portraits, or glamour. I have never seen production figures for it, but I do know it is very hard to find. It's 85mm focal length is ideal for portraiture, much better than Canon's EOS 135 soft focus where the photog is too far away from the model.